Randomized trials conducted in developing countries have demonstrated that breastfeeding peer counseling increases rates of breastfeeding initiation and improves the duration of breastfeeding (Morrow et al. 1999; Haider et al. 2000). We are conducting a randomized community trial, designed to evaluate the effectiveness of an existing community-based breastfeeding peer counseling program serving mostly low income Latinas (i.e., women from Spanish-speaking countries in Latin America or the Caribbean) in Hartford, CT. 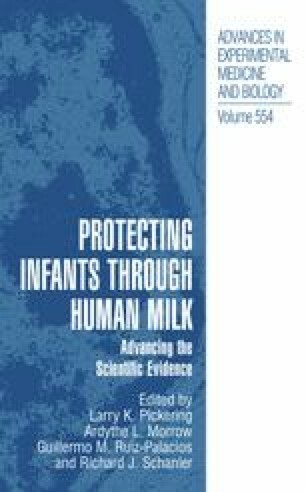 Preliminary data from this on-going study previously have shown that subjects randomized to receive breastfeeding peer counseling have a median breastfeeding duration one month greater than their counterparts who did not receive breastfeeding peer counseling (1.75 mo vs. 0.8 mo, P<0.05) (Chapman et al. 2002). The objectives of this analysis are to: a) report on a process evaluation of the program, focusing on actual coverage of pre-, peri-, and postnatal services; and b) determine if differences in the degree and timing of the exposure to breastfeeding peer counseling services are associated with breastfeeding duration.